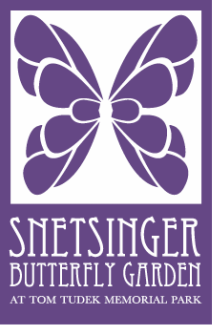 At first glance on a walk through the park, the Snetsinger Butterfly Garden may appear bleak and desolate, settled down for a long winter slumber. Many visitors, on closer inspection, might be surprised to see how much activity takes place in the winter landscape. The gardeners of the SBG keep winter in mind when planning the garden to help wildlife survive and thrive throughout the winter. One of our favorite parts about maintaining a butterfly garden is the hands-off approach to fall garden clean-up. To some, the garden might seem a bit unruly by late fall, but beneath the leaf litter, plant canes and seed heads is the wildlife that relies on the garden for its very existence. Not only does this approach provide food and shelter for wildlife, but it also conserves resources, builds healthy soil, and saves time, money, and energy. Although it might be quite a challenge to spot an overwintering chrysalis in the winter landscape, there is still much to explore during a stroll through the Snetsinger Butterfly Garden. Many of the butterflies we’ve attracted to our gardens spend the winter in the garden as an egg, a partially grown caterpillar, or a chrysalis. You might be amazed at how many overwintering butterflies are camouflaged in the winter garden. Many of the butterflies, including the showy swallowtails that frequent the Snetsinger Butterfly Garden, survive the winter as a chrysalis in a state of suspended animation called diapause. Hanging from a sturdy stem, sometimes disguised as a dry rolled up leaf, an Eastern Black Swallowtail is sheltered by the winter garden. The color palette of the winter landscape is breathtaking, with copper, silvers, rusts, ivories and chocolate. Native grasses, such as little bluestem, Schizachyrium scoparium, fill the garden with movement and beauty while providing food for visiting birds and insects. In winter, its blue-green foliage turns copper, persisting through winter snows. The fuzzy white seeds are of particular value to small birds like the American Tree Sparrow or the American Goldfinch. Come summer, little bluestem is also a major butterfly larvae host plant. A large stand of little bluestem can be found in the Pennsylvania Native Plant Society Demonstration Garden. Goldenrods supply an interesting food for winter birds. Galls are formed when larvae of the goldenrod gall fly chew on the stem tissues. 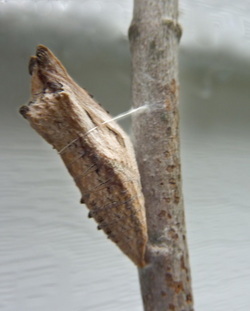 The saliva of the larvae contains a chemical, which causes the plant to swell and form a gall. The thickened tissue provides both food and protection for the developing larvae, which overwinter inside. Chickadees and downy woodpeckers seek out these galls and break them to feed on the larvae. Without the leaves, the galls are easy to spot in the winter landscape. Many hardy evergreen native plants add green to nature’s winter palette. The aromatic eastern red cedar, Juniperus virginiana, has blue berries that provide wildlife with late winter food. In summer, the tree is host to the Juniper hairstreak. Found throughout the habitat, the striking stag-horn sumac, Rhus typhina, is a native deciduous shrub with red fruiting cones which persist throughout the winter. The berries attract all sorts of feathered attention from wintering birds such as the eastern bluebird and northern mockingbird. Like the velvet on the new horns of a deer in spring, the branches are soft to the touch, an instant reminder to the name, staghorn. Honeybees are attracted to the flowers in spring, and in addition, the sumac provides nesting materials for native bees. To a gardener, winter is a time to pore over seed catalogs and create plant wish lists for the upcoming growing season. It is also time to explore the winter landscape, to observe first hand the awe and wonder that nature can inspire.